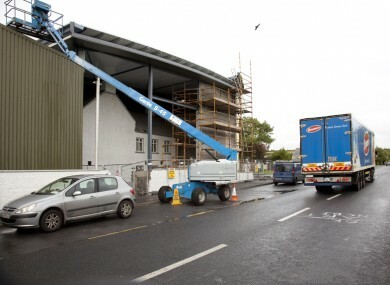 The old school being encased by the Glanbia structure in Ballitore, Co. Kildare. The building is due to be demolished this weekend. A HISTORIC BUILDING which is due to be demolished to give way for a redevelopment by the food company Glanbia has caused controversy in the village of Ballitore, County Kildare. The building has a rich history, once being the home to the famous Abraham Shackelton school, ancestor to the explorer Ernest. Students travelled from many countries to be educated in the Quaker school. The philosopher Edmund Burke and Cardinal Cullen were educated in the school. It was also used as an RIC barracks at one point. It is believed that the demolition of the building for redevelopment by Glanbia is due to take place this weekend, but some locals want to save the building, arguing that it is important to the history of the town. This is the first Quaker settlement in Ireland, as far as I am aware, and this building is an important part of history. Ballitore is a very beautiful village, but just like any other village in the country, the local businesses are hanging on where they can. Many would like to see more promotion of tourism in the village and historical buildings are important for that reason. We want to maintain the ambience of a historical village. While he said that Glanbia is a good employer and brings employment to the locality, he said that often when large companies come into a small town they are not very “sensitive” to its surroundings. “This is a large warehouse structure at street view and will make for grim viewing when you are driving by,” he said. The 18th century building was a listed building up until 2011 and was on the Record of Protected Structures (RPS). However, in 2012 Kildare County Council decided to delist it. A spokesperson for the council told TheJournal.ie that in the lead up to the preparation of the County Development Plan 2011-2017 a firm of consultants were “engaged to assess many of the structures which were on or could potentially be on the RPS. The consultants recommended that the building not be included in the Draft Development Plan”. They said that the National Inventory of Architectural Heritage (NIAH), while listing the building, stated that “it has been enveloped in the late twentieth century by a range of factory buildings… and extensively renovated in the late twentieth century, the building retains little of its original features and materials”. This concurs with the conclusions drawn and recommendation made by the council’s own conservation advisors which stated that the structure has been significantly altered and refurbished to the extent that it no longer retains any features of special significance. They added that the Glanbia development was granted full planning permission by Kildare County Council and that the application went through the same planning application procedure as any other and was out on public display. “Planning Permission was granted, appealed to An Bord Pleanala, who confirmed the council’s decision to grant permission,” she said. Local James Fennell disagrees with the council and says that it is an important example of Ireland’s 18th century architecture. “I and many others who care about our architectural heritage and the aesthetics of our landscape are urgently trying to gain support for an enquiry or hold on what is happening,” he said. If there is an increase in delisting buildings, then we must be cautious. I think Glanbia is an excellent company, it provides many jobs at a time when they are scarce, but I think that large companies need to be sensitive to their surroundings and they have a responsibility and social duty to the town too. These buildings were listed for a good reason in the first place. If we have learned nothing from the planning mishaps in the past we must learn that there has to be balance between employment, the building of large structures in towns and the protection of a town’s history. Email “Kildare locals question why old Quaker school was delisted and is due to be demolished”. Feedback on “Kildare locals question why old Quaker school was delisted and is due to be demolished”.